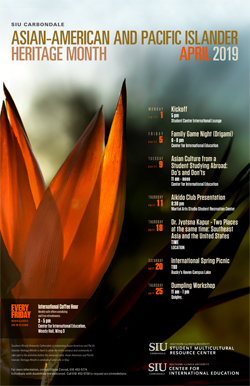 CARBONDALE, Ill. — Southern Illinois University Carbondale is recognizing April as Asian American and Pacific Islander Heritage Month with numerous special events. The schedule includes demonstrations, workshops, guest speakers, fun and games and other activities. Everything is free and open to the public. The official kick-off is set for 5 p.m. Monday at the Student Center’s International Lounge. Enjoy a Chinese calligraphy performance by Zeshuying Zhu, a senior accounting major. Refreshments and a special guest speaker will be featured as well. Bring the family and friends for games and entertaining demonstrations planned throughout the month. Everyone is welcome at the International Family Game Night, set for 6-8 p.m. on April 5 at the Center for International Education, located in Woody Hall. Bingo, international games, prizes and refreshments – it’s all happening that evening. You won’t want to miss a special demonstration by the Filipino Martial Arts Club. They will host a special seminar on Filipino Martial Arts at the Student Recreation Center on April 6. The time will be announced. Learn about the variety of study abroad programs SIU offers in Asia and the Pacific during a presentation at 11 a.m. on April 9 in the Center for International Education. Find out how you can earn academic credit through the program and use financial aid as well as the dos and don’ts of studying in another country. Study abroad alumni will be on hand to answer questions and tell about the student life experience abroad. Jyotsna Kapur will present “Two places at the same time: Southeast Asia and the United States” at 11 a.m., April 18, in Student Service Services Building, Room 150. Kapur is the director of University Honors and is also a professor of cinema and photography with a cross appointment in sociology. She teaches course in media arts theory, documentary practices, analysis of visual culture and peace studies. A trio of events offers the opportunity to get acquainted with the Asian American and Pacific Islander community and experience global cuisine. The International Spring Picnic on April 20 at the Campus Lake boat dock showcases SIU’s international registered student organizations and gives those attending chance to enjoy food from all over the globe. The new International Student Council board member will be introduced as well. The time is to be announced. There will also be an international coffee hour every Friday, 3-5 p.m. at the Center for International Education. It’s a chance for students from the U.S. and abroad to connect with one another and community members. Come and go, much as you would at an open house. Learn to make traditional Chinese dumplings at a workshop set for 11 a.m.-1 p.m. on April 25 at Quigley Hall, Room 212. It’s free and everyone is welcome. To learn more about Asian American and Pacific Islander Heritage Month, and find the current updated schedule, visit the Student Multicultural Resource Center website or call 618/453-3740.